For those of you not in the know, at the beginning of each month we send out a newsletter to all members of the CFZ. 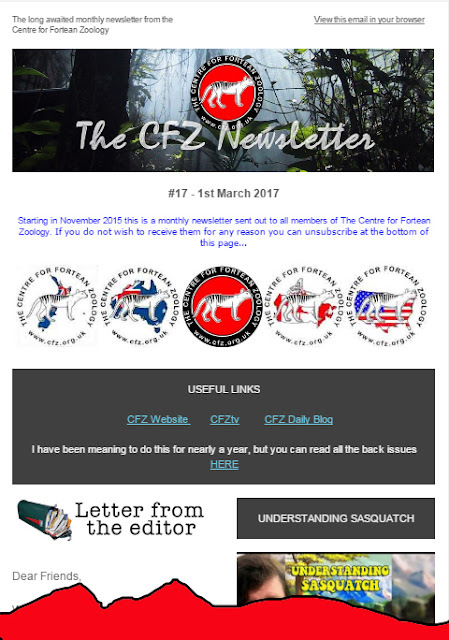 The most recent (which went out this evening) included articles on a ghostly badger, an alternative way of looking at Bigfoot, and a lost tiger, the return of OTT, Expedition Profiles for 2017, Notes and Queries etc. Sad news today I am afraid. The baby dove which was brought in on Sunday died yesterday evening. It is always heartbreaking when this happens, but we were expecting it, and at least it died in the warm and the dark not being eaten alive by a rat or cat or by being trod on by a drunken thug. One has to do what one can to make the world a better place even if it doesn't work out.